If you’re a fan of beautiful, healthy hair, we’ve got incroyable news for you. Now through November 6, get complimentary products with qualifying purchases from Kérastase. Kérastase has hair-transforming products that deliver real results for every imaginable hair type. Their newest product, L’incroyable Blowdry Crème, is billed as “the perfect blowdry in a tube” for thick or unruly hair. 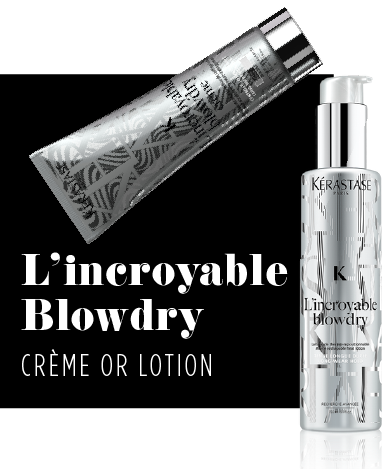 Along with the original L’incroyable Blowdry Lotion, it makes for faster styling, reshapability, and long lasting shape memory and shine without compromising touchability. Learn more about all the products below, then stop by and let us help you get your crème de la crème locks. Dry volumizing and texturizing spray. Immediate body, volume and grip that creates either structured or tousled tresses. Reshapeable hold can instantly provide body, volume and grip. Provides anti-humidity protection, great for second day hair styling, and invisible formula without oily or white residue. Medium hold hairspray. A micro-fine hairspray that sets all styles in place with a flexible long-lasting hold. Works perfectly with heat tools. Sets and locks styles, highly workable, frizz control, UV filter & heat protection, anti-frizz and humidity protection, and color protection. Miracle reshapable heat lotion. Heat-sensitive microwax technology allows the hair to set and re-set styles with ease. Extremely repositionable, unparalleled shape memory, 96 hour extreme anti-fizz control, 450° thermo-protection. Opulent reshapable heat styling cream. The incredible formula you know and love, now for normal to thick hair. Opulent heat-sensitive microwax technology allows the hair to set and reset styles with ease. The cream is extremely repositionable and provides for 3X faster flat ironing (vs no product), unparalleled shape memory, 96 HR extreme anti-frizz control and 450* thermo-protection. Valid October 16, 2017 through November 6, 2017. Not to be combined with any other offers or promotions. 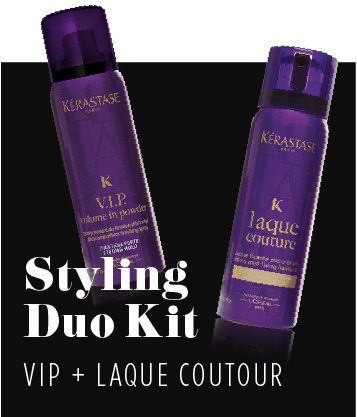 Product descriptions via kerastase-usa.com.